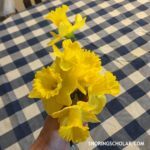 A few years ago, back when I was juggling multiple evening meetings every month and staying active in other activities that took me away from home, my husband said something that brought me to a screeching halt, something that made me not only consider what I was doing but also what I was called to do. A year later, we were blessed with our first child, and she served as another signpost in my journey to less. Each subsequent child has been a lesson in the blessing of more and the gift of learning to say no. I’ve learned to say no, but even when it is for the good of my family, my children, myself, it’s still hard. People don’t want to hear me say no. We’re all so busy, and we have come to expect busyness. I find that I don’t know what to do in the stillness and silence; I don’t know how to relax and let go. If I find myself with an extra five minutes, I’m battling the temptation to insert something into it. One hundred years ago, when that house was built, there wasn’t an easy, efficient, or cheap way to get to town. Going to town was an event, and while there, you got everything you needed or you lived without it. One hundred years ago, I don’t think there were evening meetings at every facility in town. One hundred years ago, there wasn’t electricity, so the ebb and flow of the days and seasons mattered in a way we seem to have forgotten. It was 100 years ago, in 1917, that three young children were out in the fields, near Fatima, Portugal, enjoying the sunshine while they prayed their rosary and watched their sheep. Theirs was a simple life, or at least it seems so from where I sit, bogged down with obligations and errands and the busy stuff of modern life. On the other hand, having lived in an old house long enough to have lost all romantic notions about it, these children lived at a time — and in a place — when my old house would be considered brand-new. That thought makes me consider…if that house was available to them, it would probably have seemed like a mansion or at least a luxurious place to live. Its big 16-by-16 rooms would have given them plenty of room to play with their cousins and siblings on the rainy days; would the worn wood floors have seemed extravagant next to their dirt floors? I can imagine few adventures that would be as grand as being given permission to go outside and play in the pasture while the sheep ate. I don’t know what perils and difficulties it would have involved, and though I know that farm children of the early 1900s had a different level of responsibility than children of the same age today, I suspect they enjoyed their time in the pasture. Lucia, the oldest of the three children at ten, was known for her excellent memory, learning the catechism lessons and making her First Communion by age six and then becoming a catechist to others at nine. She was the youngest of her six siblings, and her two younger cousins, Francisco, age 8, and Jacinta, age 6, loved playing with her so much that they insisted on being included when Lucia was assigned the pasturing responsibilities with the sheep. Can you hear them, standing in the valley a distance from their home, calling out words and names to hear the echo? Can you see them, making a picnic of their lunch, and when the time came to say their rosary, shortening it so that they were only saying the first words of each prayer? These three children were raised with faith at the center of their upbringing. The stories they were told at home were from the Bible and the village priest was both their hero and their authority. In May of 1916, sent to the shelter of an olive grove because of light rain, Lucia, Francisco, and Jacinta, had finished their lunch and rosary and were playing a game with pebbles when a strong wind made them look around. They saw a white light in the form of a young man, transparent, coming toward them. The children could say nothing, but only looked on as the man came closer. The young man was the angel of peace, and during the three times he met with the children, once more in the summer and again in the fall of 1916, he taught them deeper reverence and specific prayers to pray for Portugal and the world. We can look back over the events and see this time of the angelic apparitions as a time of tutelage for the children, preparing them for what was to follow. It was almost eight months after the last apparition of the angel, on May 13, 1917, feast of Our Lady of the Blessed Sacrament, when Mary first appeared to the children. They were pasturing their sheep in the Cova da Iria, or Cove of Irene, a hilly hollow owned by Lucia’s father, which was where, with one exception, that Mary would appear to the children on the six occasions in 1917 and to Lucia alone in 1920. Lucia, Francisco, and Jacinta stopped, so near to the apparition that they were in the light surrounding the lady. Lucia was the spokesman for the children, perhaps by virtue of her engaging personality and insatiable curiosity. She said that she felt no fear, only gladness and confident joy. 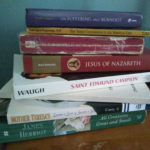 The lady asked them to return on the thirteenth of each month for six months, and after a brief conversation, in which the lady charged them with praying the rosary every day to bring peace to the world, she left. In May, 1917, World War I was in full throttle in Europe, ushering in a new kind of savagery in warfare. In Moscow, Lenin was preparing the revolution that would topple the Russian social order and eventually include nearly half the people on earth. 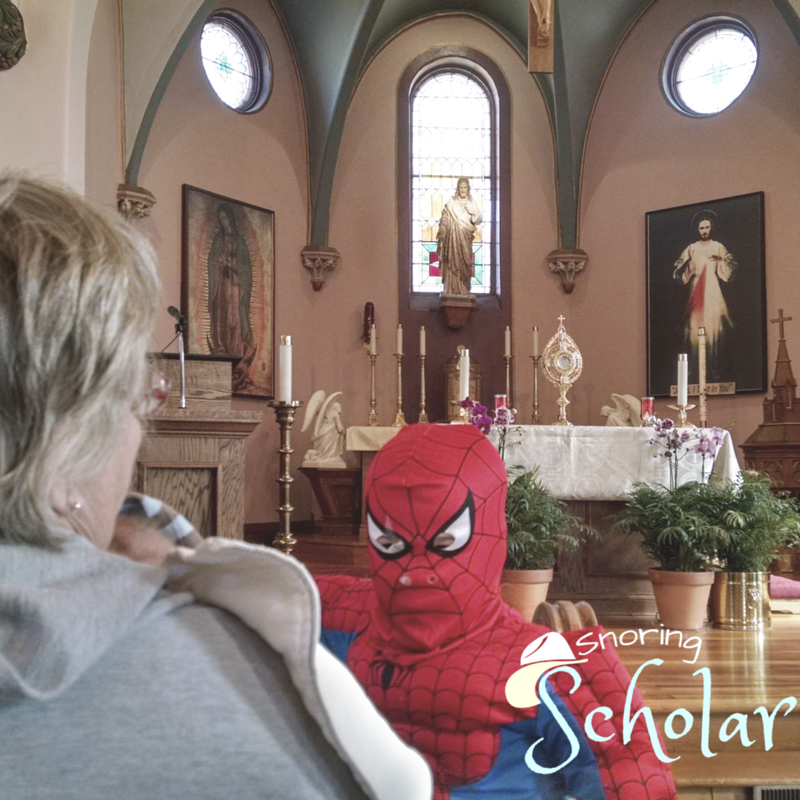 In those circumstances, a visit from Mary bore the antidote to the evil of the planet. The rosary is a weapon in our prayer lives. Our Lady of Fatima asked simple shepherd children to end the war through their prayers. Though the children were filled with excitement, Lucia cautioned them to keep the visit a secret. Jacinta, though, simply could not. In her seven-year-old world, this was too much to keep quiet, and she told her family. 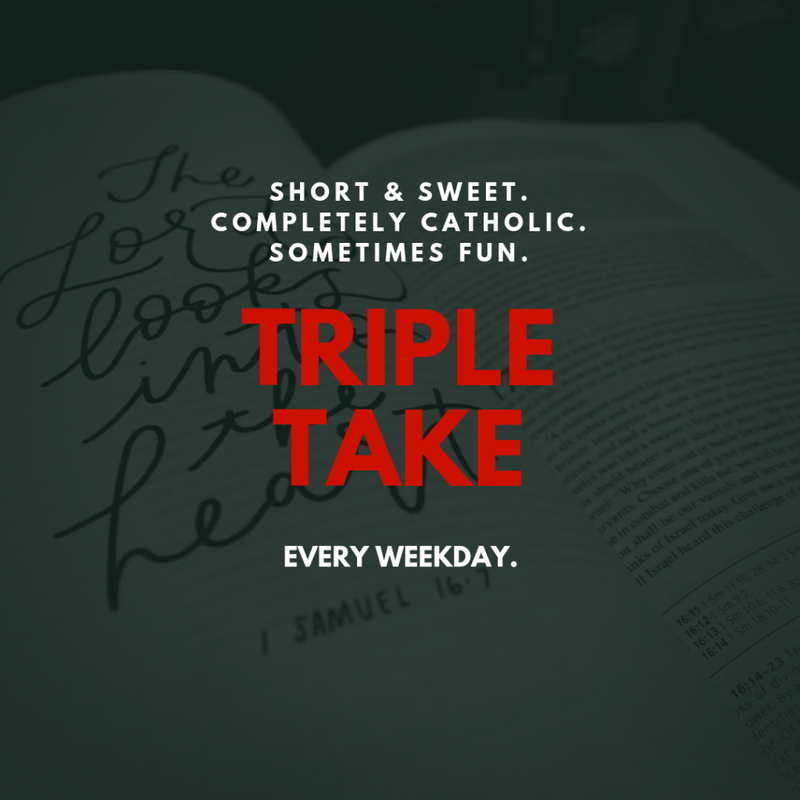 Her mother didn’t think much of it, her siblings teased her, but her father accepted it as true immediately, seeing the honesty of children and the simple workings of God. When Lucia’s mother heard the tale, though, she was furious with her daughter for inventing such a blasphemy, and used threats to no avail, trying to get her daughter to admit the fiction of the story. She took Lucia before the parish priest and only grew more and more upset with her daughter. There was no dissuading Lucia, nor either of the other children. They went on June 13, and on each of the following months, just as the lady had requested. A parish festival, the biggest of the year, did not distract them in June, and an arrest in August didn’t either. In each of her apparitions, Mary reminds the children to pray the rosary daily. She came to the children after the angel; she appeared only after they had been prepared and taught. Though children, Mary asked them to pray for peace in the world and an end to the war, and she had an expectation — a knowledge — that the prayers of these simple shepherd children would, in fact, make a difference. When the supernatural comes in contact with earth, there are unexplainable phenomena that often accompany it, and it’s easy to get distracted so that we only pay attention to those aspects. 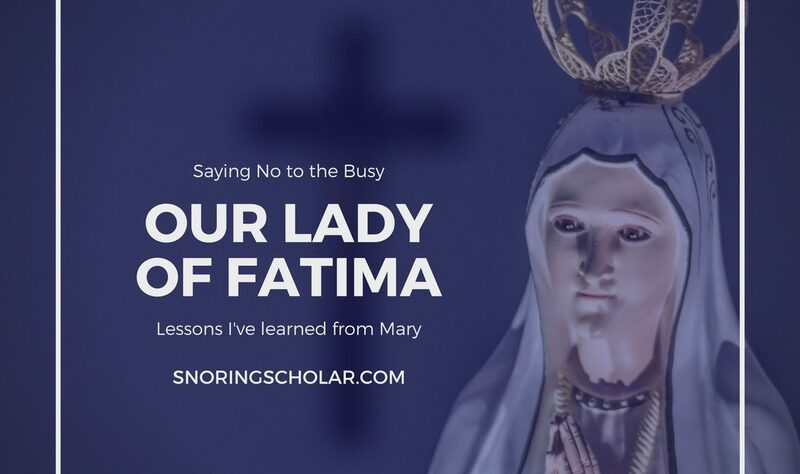 The Fatima apparitions have their share of cool phenomena associated with them, but it’s more important to apply the message to our everyday lives, to see the importance of what was said and taught to us through the three children. In our busy modern lives, filled with meetings and errands and tasks, we often lose sight of the importance of prayer. We have all this technology, from being able to wash clothes and dishes in machines to communicating with people across the planet instantly. We can go wherever we want, whenever we want, and there’s no limit on when we wake or when we sleep, save that of the schedules we set. Our science tells us we can create life, ignoring the Maker who made that science possible, looking past the mystery underneath it all, pretending to understand that which remains a mystery, though worded differently now than in the past. It’s easy to think WE are in control. It’s easy to forget why we were made and even easier to lose sight of Who made us. 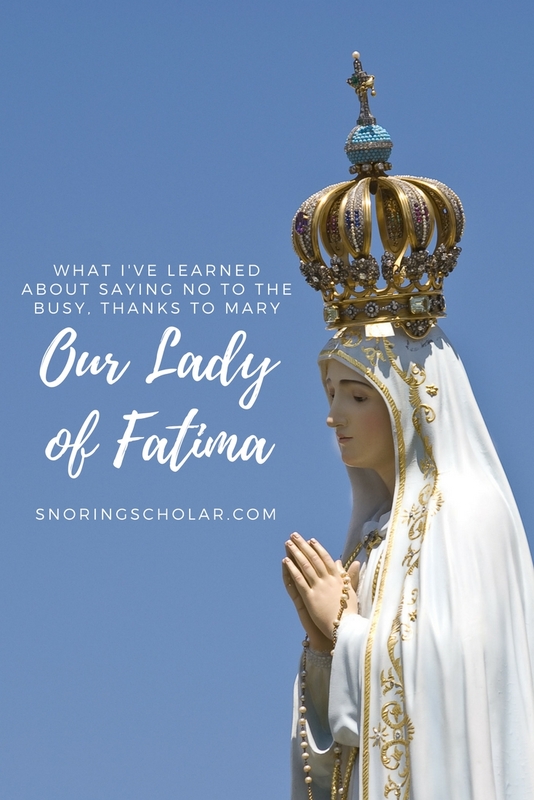 Mary, Our Lady of Fatima, stops me just as I start to consider doing that something extra that will take me away from the hard — and vital — work of nurturing life in the domestic church of my home. When I’m feeling too busy, she reminds me to pray a rosary every day, because, in the end, THAT is what matters in my life. Maybe I’ll pray it all at once, and maybe it will be the kind of day where it’s a decade here, a decade there. Maybe I’ll forget a Hail Mary and maybe I’ll add an extra. 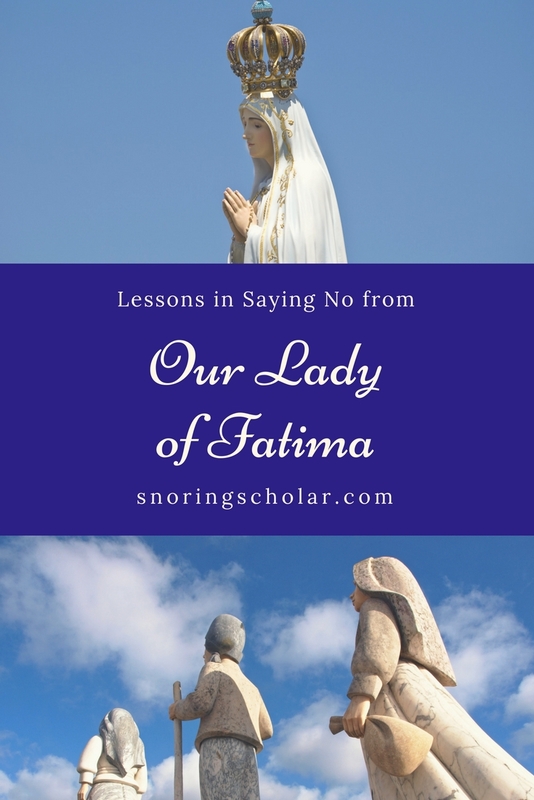 Mary, in her apparitions at Fatima, is asking me to say “no” to the demands and the pressures. She is giving me an answer to the busyness that pervades our lives and competes with our prayer time: the rosary. 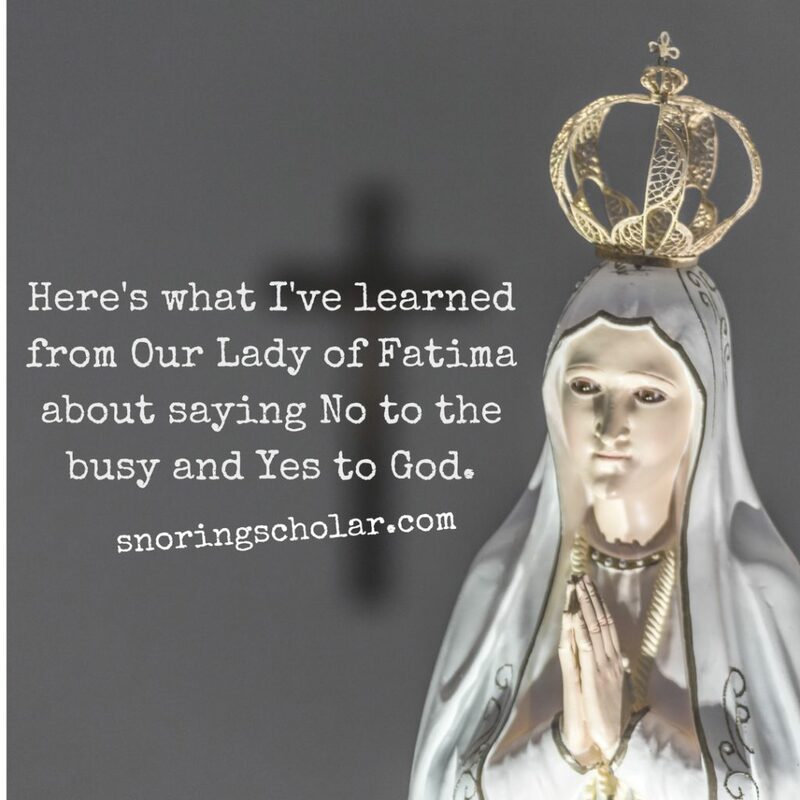 She reminds me that saying “no” to one thing can be a way of saying “yes” to another; maybe I’m rejecting what I could be doing, yes, but in doing that, embracing what I should be doing. 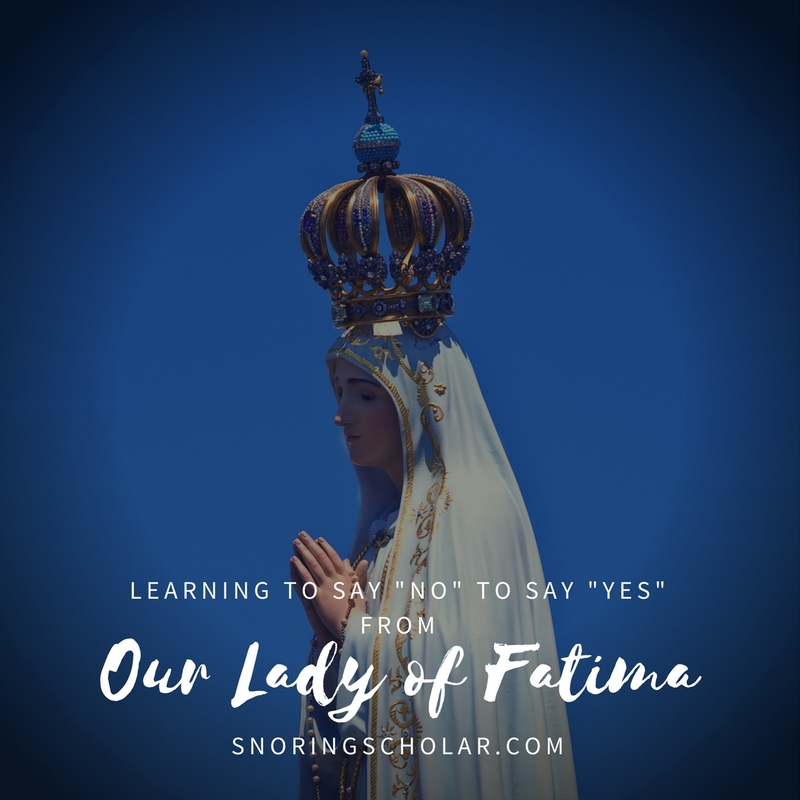 Our Lady of Fatima challenges me in my world view, when I feel that it’s naive and silly to pray for the good of the world. She points to my pride and makes me realize that it’s selfish of me NOT to pray for the larger world, to shoot for the moon in my intentions. She assures me that, however I feel, God hears my prayers and God cares about me. I have to use my free will to say those prayers, though, or God can’t answer them. 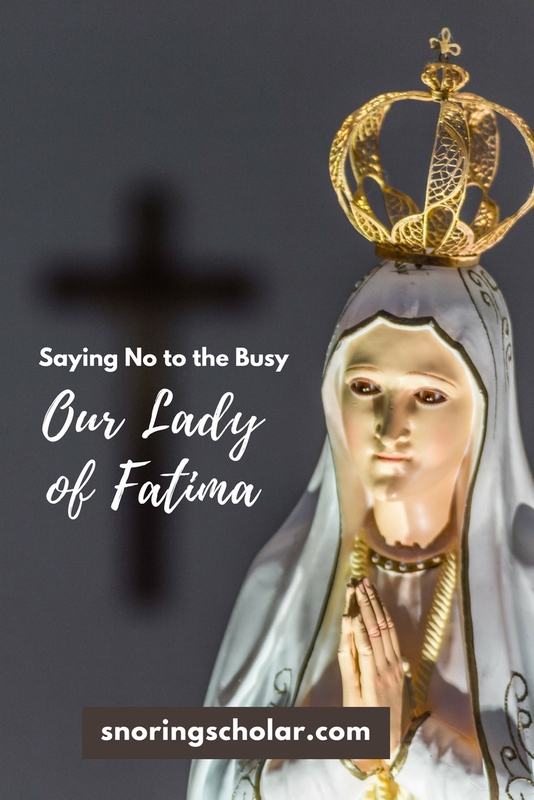 At Fatima, I am also reminded that God qualifies us for the work He calls us to do. I don’t often feel like I’m the right person — to be mother of my children, to be employed at my parish, to be wife to my husband. I feel so incompetent, so unqualified, so overwhelmed. Our Lady of Fatima shows me, so clearly, that God will send me the help I need. It might be in the form of an angel who will prompt me to pray or in the guise of a friend who will call at just the right time. God is watching me; He cares. The smallest concern of mine still matters to Him. 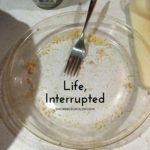 Thanks for this beautiful blog and the reminder that stopping and listening are so important. May God bless you abundantly for sharing your life with us. 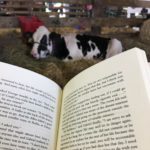 As always this is a beautiful blog and made me stop and think. It also reminds me that prays are important. When I retired I said my job was now to pray for everyone. Not sure when I said that how important it is to take a few minutes (or longer if you have time) to lift up the world to God’s care. It has been an interesting journey to say the least. it should say prayers not prays! Thanks so much, Jan! I’m glad you enjoyed it and I hope Mary walks with you as you seek peace!